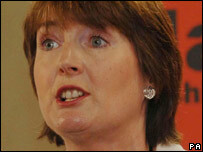 Justice Minister Harriet Harman has called for equal pay for men and women by 2020. Ms Harman, one of six MPs running for the deputy Labour leadership, said there were "targets for all the other things we care about" but not pay. She called for an audit of gender pay in the private and public sectors. Speaking on GMTV, she also said the voting age should be lowered to 16, as did her rival Hilary Benn, the international development secretary. Ms Harman said despite the Equal Pay Act coming into effect in 1975, women in 2007 earned only two-thirds of what men earn. "We have targets for all the other things we care about - for tackling child poverty, for reducing carbon emissions, for cutting hospital waiting times. We even have targets for children in Africa to go to primary school," she said. "Why don't we have a target for ending unequal pay between men and women? And I think we should set it at 2020." She added that establishing equal pay was "not just as a matter of principle" but would also contribute to ending child poverty. "And it also does something to tackle the unequal division of labour in the home," she said. "If men are always earning more than women, then when the baby comes along, the man has to work more and sees less of the children." She said ministers should set a "legal requirement" to have a gender pay audit, an idea also suggested by her fellow deputy contender Jon Cruddas. She dismissed criticism that such a policy would impose extra regulations on the private sector. Speaking on the same programme, Mr Benn said lowering the voting age to 16 would encourage people to vote but was not optimistic it would improve voter turnout. "There's lots of other things which we allow 16 year olds to do and I think we should be encouraging them to participate in our political system, but it's not a fix, it's not a solution. "In the end it's about persuading people and politics is a means of helping them to improve their lives and better themselves and their communities." Ms Harman supported a lowering of the voting age as "it looks as though young people are not actually going to vote when they get older". She said: "One of the arguments for votes at 16 is that if you really beef up your citizenship education, the children come straight out of very good citizenship education and into the polling booth, and if you leave them for a couple of years they've gone off the boil and never get into the voting habit."